517 of 523 people found the following review helpful. [[VIDEOID:moLK0DOJKUBTPH]]That is the question that I hope to help you answer. :) The answer for me after using both versions? To sensor. 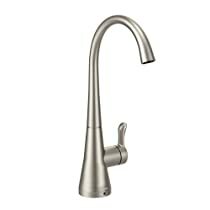 Three months ago, I shopped around and settled on a Moen 7594SRS Arbor, which is the non-Motionsense version of this faucet in spot resistance stainless. So, I clearly like the look because I picked it over the other options out there. I really like it and gave it five stars in my review of it here. The Arbor design is very attractive to me and also very functional - the high neck and pulldown spout are excellent. I picked the sensorless version over the Motionsense version for three main reasons: (1) it was my first faucet installation and it looked less complicated to install, (2) it didn't have electronic sensors and a solenoid that could break down, and (3) it cost about $150 less. Last month, I got the very fortunate opportunity to try out the Motionsense model for free as part of the Vine program. So, I hope that my experience with both models can help you decide between them. The video is mostly intended to show off the faucet and some of the features, as well as show the sensors working. More details are below. Overall, I'm very happy with the sensors. The ready sensor located on the front is my favorite. For washing hands, it is excellent. I like that I use less water (because it isn't running while I soap up), and I like that I don't grab the handle with wet hands and get water spots all over it. I haven't used the two-minute sensor on the top much. I didn't think that I'd like the chrome finish as well as the spot resistant stainless because I thought it would show spots more, but it really doesn't. They are both attractive finishes. (*) The temperature control for water dispensed using the sensors is located on the control box under the sink. I understand that the handle cannot be used for this, but I wish that Moen would have placed the dial on the faucet assembly above the sink (like a little turn dial on the base of the cylinder) to make it easier to change. (*) There's no easy way to adjust the flow rate of the water dispensed using the sensors. It's either no flow or full flow. I can see that would be difficult to incorporate, so it's not a criticism but a note so that you're aware of it. Overall, installation isn't bad once you get your old faucet out. While it is more complicated than the install for the version without sensors, it's essentially one added step of mounting the control box and plugging in a few more hoses. Knowing what I know now, I would not have decided against the Motionsense because of installation. I have a suggestion if you're installing this by yourself. I suggest wrapping the main faucet with a towel or similar after you put it in the hole and until you have the securing nut tight underneath. There's nothing that holds the faucet in place until the nut is tight, so it can fall over (which my first one did on me) unless you balance it, and it's easy to bump it off balance while your fumbling with the hardware underneath of the sink. Just based on design complexity, the edge goes to the regular model, IMO...but I'm not concerned about this one. I chose Moen for my first purchase because all of the faucets in my house (which is over 14 years old) are Moen that still work great. I do trust the brand. That said, I have thought about what to do if control box fails, including if the solenoid in the control box begins to leak. It's great that the water flow controlled by the handle doesn't require the electronics in the control box. So, if the batteries get low or the electronics fail, your faucet will still work just like a normal faucet. Unfortunately, the connections that Moen picked don't allow you to simply pull the control box out of the system (say, to get it fixed under warranty). The water lines coming from the handle don't use 3/8" screw on connections for your main water lines, but rather have push fit ends. It looks like Lowe's sells GatorBITE adapters that would let you adapt them to your water lines, but I haven't used them myself. WHAT ELSE IS DIFFERENT BETWEEN THE MODELS? (*) The handle on the regular model can be located on the right side, left side, or anywhere in between. I like that. The Motionsense model is located on the right side only. The neck of the Motionsense model has hard stops to limit its travel, so if you point the handle anywhere else, the spout won't necessary pivot over your sink. SO, IS IT WORTH THE ADDED COST? Only you can decide on this, but I'll say that I think it's worth it. I had the Moen faucet that came with my house for over 12 years before deciding to get something new (and it still worked fine), and I expect that I'll use this faucet for a long time. Given that, and given how much I like the sensors (mostly the one in front), I'd say it's worth it. I know that I was able to try this version for free, but I thought quite a bit about this model before I bought the other version last October, so I believe that I'm considering it fairly. I hope that helps. If you have any questions, please feel free to ask in a comment. Thanks! UPDATE September 19, 2014: I was recently able to try out the Moen 7185EC Brantford with Motion Sense, Chrome. It is the functional twin to this Arbor, so much so that the instruction manual is the same for both models. The Brantford has a different aesthetic, though, so I wanted to point it out in case you like the sensors but want a different look. I did a video review of that model, too, which shows the Arbor and Brantford side by side. I actually have the Brantford installed right now for a change from the Arbor, but I'll probably switch back because I like the Arbor so much. 136 of 143 people found the following review helpful. My Kitchen faucet that came with my house rusted inside and broke. I read numerous negative reviews on the Delta touch faucet so I decided to wait until the Moen Motionsense hit the market. I'm glad I waited because this faucet it is as good as advertised. I can't stop playing around with the faucet. My wife loves it and it's easier for my kids to get water without making a mess. I bought the faucet from faucet warehouse, not from Amazon because I preordered it (so I'm probably one of the first people to own it). INSTALLATION. The install is very easy, in my opinion. It's about the same as any other faucet install with the exception of the control box. You install the faucet base the same as any other faucet. It comes with a tool to tighten it down so you don't need a single tool. After the base is installed, the differences come in. Normally you'd connect the faucet water supply lines directly to the hot and cold water supply valves. For this faucet, you screw a control box to the back of the cabinet. The supply lines from the faucet plug into the control box. The control box is what controls the flow via "motionsense." The supply lines are easy to connect to the control box, you just push them in. Then you connect the supply lines from the control box to the water supply valves. Everything is marked and is easy to follow. I would suggest you follow the instruction manual even though its not complicated. 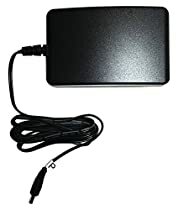 I also highly recommend purchasing the AC adapter. Otherwise, you will use batteries (Moen includes a set of batteries for the initial install). The AC adapter is not included (at least it wasn't when I purchased it). USE. The motion sensors work wonderfully. The "ready sensor" which is meant to turn on the water when you put your hands underneath the faucet is very useful but obviously, whenever an object is placed in the path of the sensor, the water will turn on. The top sensor works great, you simply put your hand over it and it turns on. You can preset the water temperature at the aforementioned control box. The handle overrides everything so if you use one of the sensors to turn on the faucet you can use the handle to adjust the water flow rate and temperature, and, of course, turn it off completely. You can turn off the sensors (one or both) by merely keeping your hand above the top sensor for something like three seconds (the manual gives instructions for this). OTHER. This faucet is the same as the regular faucet (Moen Arbor)except with Motionsense. So if you don't like the faucet height or the way the faucet hose extends and retracts, then you won't like the regular faucet either. I find that the faucet extends and retracts very well. However, it is important to properly place the weight on the extension hose. In fact, I like it better than the regular Delta faucet we had before. Conclusion: This is the best kitchen faucet I've ever used. I've had it since October and it works great. I highly recommend it and once you have motionsense you'll never want to own a regular faucet again. IT IS THE BEST FAUCET EVER! Update 6/15/13: This faucet is still the best I've ever owned. A few people have asked me questions so I wanted to add some insight here. The control box allows you to set the temperature of the water when you use motionsense. So theoretically you could set your faucet to have steaming hot water whenever you turn on the faucet using motionsense. However, the control box doesn't heat the water. So you still have to wait a few seconds for the warm water to get to your faucet. I set my control box right up the middle between cold and hot. Control box settings don't affect the faucet if you use the handle. The faucet turns off automatically after 2 minutes if you turned it on with motionsense. So could your animal turn it on? Sure...if it waved a paw over the top of it. But it would go off after 2 minutes. The handle overrides all motionsense operations. 170 of 181 people found the following review helpful. I spent a lot more than I typically do when I purchased the Moen Motionsense, because I decided I wanted a quality unit that would not cause me headaches down the road. Unfortunately that has not been the case at all. Install went smoothly, and I was initially happy with the product. About 6 months after install I noticed a small drip of water coming from the valve handle. I then noticed water was also leaking out of the bottom of the unit under the sink as well, both drips were from the same issue, but I already had a good sized puddle in the bottom of the cabinet before I discovered the leak. I took the unit apart assuming it may need a new o-ring, etc. I found that the temperature mixing valve needed to be tightened up (this is a factory assembled part, so it would had nothing to do with my install). I found this irritating, but was able to fix the issue myself. Fast forward about 3 more months and now I discovered a very large water mess under the sink cabinet. The cabinet floor and sides have both swollen and warped due to the water and will need replaced. This time the water was dripping out of the bottom of the electronic control box. I again disassembled the unit and this time the water was leaking around the diaphragm that seals the electric solenoid valve, and was leaking out of the solenoid coil body. I attempted to repair by adding some grease to the O-rings and rubber diaphragm, which worked for about 3 days, but now the leak has resumed. I am very frustrated that a $500 faucet has given me so much grief with less than 1 year of ownership. Now I am looking at getting a different faucet, and now having to do major cabinet repair as well.